ATLANTA (June 22, 2017) – A one-of-a-kind, transformative literacy program has scored a big win for Atlanta Public School (APS) students and teachers, thanks to the efforts of the college football community. Beginning this week, a three-year, $2 million APS Literacy Initiative – co-funded by the Atlanta Football Host Committee, Chick-fil-A Foundation, Chick-fil-A Peach Bowl and College Football Playoff Foundation – will better equip educators to teach literacy skills. The program represents the largest corporate gift to Atlanta Public Schools in the last five years and will be a huge asset in the district’s ongoing fight to improve literacy rates. Currently, more than one third of APS second graders read below grade level and 70 percent of teachers lack confidence teaching fundamental literacy skills. Research shows that students who do not read proficiently by the end of the third grade are four times more likely to leave school without a diploma. That is why improving childhood literacy is key to the APS transformation plan. Specialized teacher training began this week for 175 teachers and will continue over the summer session with two more weeks of training. By 2020, the literacy initiative will equip 1,500 APS teachers with the skills to deliver high-quality literacy instruction to all 25,000 APS elementary students. The training will focus on the Orton-Gillingham (O-G) approach to literacy. The O-G technique is scientifically proven to enhance reading proficiency for all learners using instruction in sight, hearing, touch and movement to help students connect language with letters and words. The goal of the training is to ensure all teachers feel comfortable teaching foundational early learning literacy skills to students including phonemic awareness, vocabulary, phonics and fluency. The APS Literacy Initiative allows the district to partner with the Institute for Multi-Sensory Education – a leading provider of direct, systematic and sequential instruction that empowers educators to teach the foundation of the English language – to run the training sessions. Funding for the program is primarily connected to Atlanta’s college football community and is an example of the positive impact the sport can have on a community. 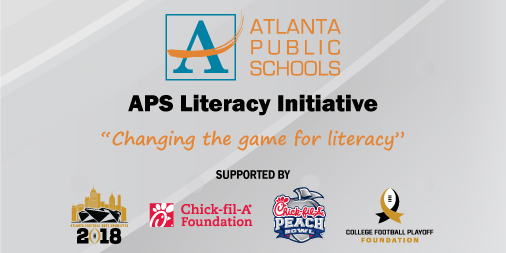 In large part, the APS Literacy Initiative is a result of Atlanta hosting the sport’s highest-profile games, including last year’s College Football Playoff Semifinal at the Chick-fil-A Peach Bowl and this year’s College Football Playoff National Championship which will be played Jan. 8, 2018 – exactly 200 days from now. In the program’s first year, 500 kindergarten and first grade teachers will be trained in sessions from June 19-23, June 26-29 and July 17-21. Teacher training will be hosted by APS at the former Sammye E. Coan Middle School building.